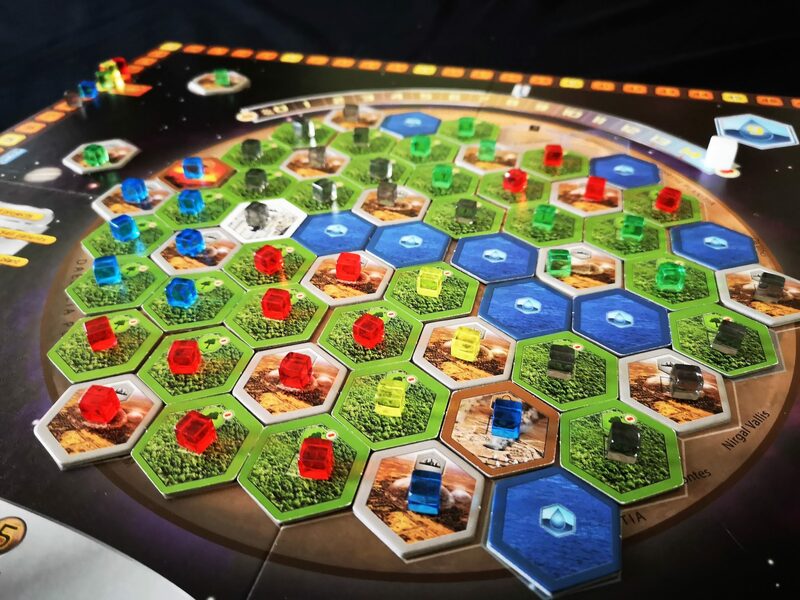 A review copy of Terraforming Mars was provided by Asmodee UK in exchange for a fair and honest review. Stronghold publish some lovely, clever games but both this and Pit Crew are dramatically let down by boderline shoddy component quality. I’m a big believer in the immersive power of good component design – that nice, satisfying pieces help us suspend disbelief. Their job is twofold – it’s to serve as an abstraction for some critical piece of game state, and to be so unobtrusive that we forget they’re even there. The components in Terraforming Mars certainly succeed as abstractions, but they’re so successful in that respect that they’re often the only thing you actually remember to fret about. Within Terraforming Mars you should be focusing on the life you’re cultivating on a remote, dusty planet. Instead you’re trying to work out if you really should have that much titanium or whether you may have committed the unforgiveable sin of nudging the table during a round of play. Every brief twitch of the fingers carries with it the risk of essentially randomising your entire player board. 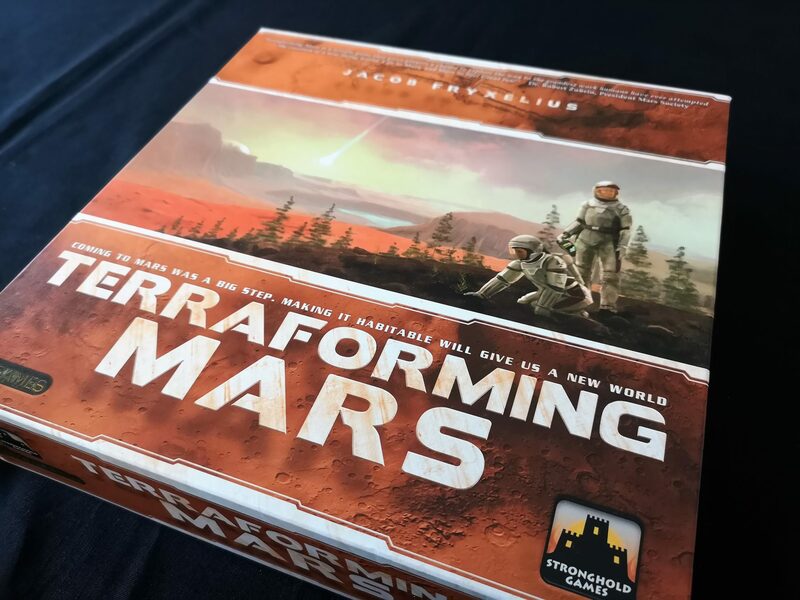 Terraforming Mars is a better game if you use as few of the components in the box as possible, and that’s not really on in this day and age. I usually try not to start off a review with complaints but it’s hard not to in this case. If I had only one single word to describe what it’s like to play Terraforming Mars it would be ‘Good God It’s Bloody Frustrating’. Frustration is by far the single most dominant emotion I associate with play. That’s unfortunate because every secondary emotion is positive. I love this game – it’s fun, full of fascinating mechanisms and satisfying decisions. It’s collegiate in its competition while also being cut-throat in its communality. It rewards creative play more than any game I’ve seen in a long time. It’s really evocative even if it manages to make breathing life into a planet look as aesthetically appealing as designing the car park of a Tesco Extra in a rundown seaside town. There’s a lot of fantastic design in here, let down what seems like aggressive indifference in the presentation. That’s almost forgivable – good aesthetics are a score multiplier, but not a foundation by themselves upon which to base a game. What makes it a cardinal sin here is that the poor component design genuinely takes the shine off of something that would otherwise have been beautiful. Buying Terraforming Mars is like taking possession of a pristine Ferrari only to find the manufacturer intentionally and malevolently dragged their keys along the bodywork. The name tells the story of what we’re doing. You take the role of a corporation that is charged with turning Mars into something habitable, ideally to a timetable compatible with the scale of ecological damage we’re doing to Earth. We’re looking for a brand-new planet to crud up like our first, and everyone is competing to speedily gain the most reputation for their hard-work on the red planet. Start as you mean to go on, right? The quicker you get this done, the quicker we can abandon Earth and the wall-to-wall SUVs that destroyed it. Players need to manage six key resources, and they’ll produce varying amounts of each dependent on the infrastructure they’ve built around their efforts. Each player has a hand of cards representing events, projects or bolt-on actions they can develop. Cards come with tags representing the broad category to which they belong, and other cards might have different effects and requirements based on the presence of tags in your tableau. ‘Can only be played if you have three science tags’, for example, or ‘Awards a point of production for every two building tags you possess’. 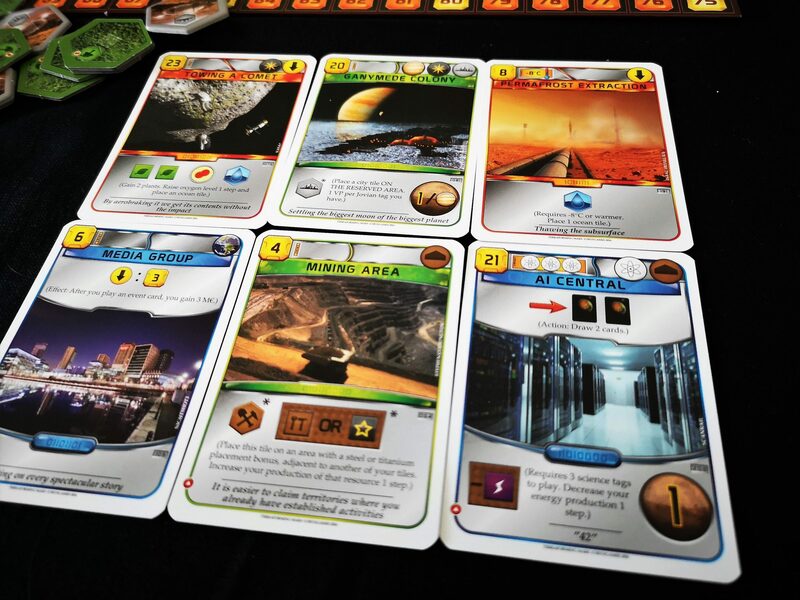 Other cards have pre-requisites linked to the terraforming progress on Mars. For example those might require a certain amount of ocean, or may only be playable at low levels of oxygen. Some of these in turn will impact on your production, letting you nudge the rate of acquisition of resources upwards or downwards as is appropriate. Mars is considered to be effectively terraformed when there’s enough of an ocean, with a high enough oxygen level, with a high enough temperature. Every time you progress one of those global parameters, the people back home cheer and you gain more money every turn. 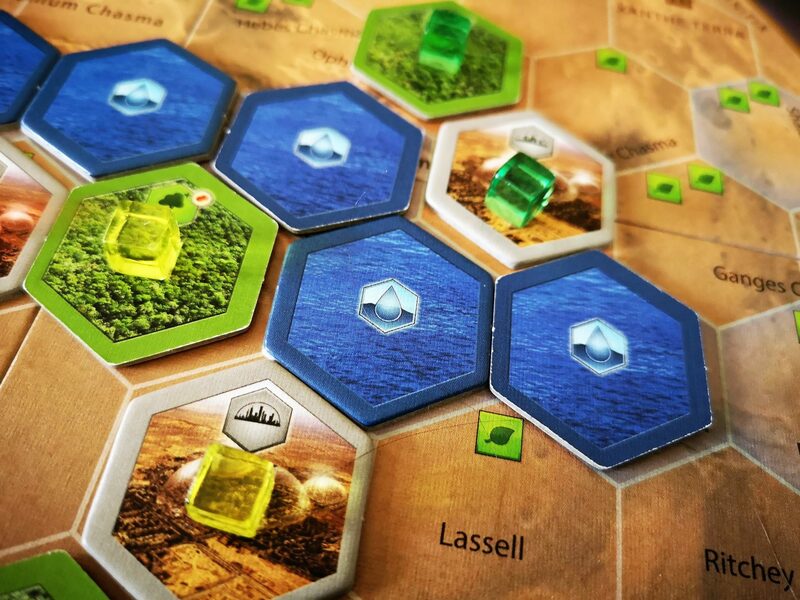 Laying down ocean, cities and greenery tiles also rewards players with bonus resources, and occasionally straight up grants monetary rewards based on elements of tile adjacency. It’s all very precise and complicated and we won’t be bothering with explaining any of it because it doesn’t matter for our purposes. That’s what the rulebook is for. What does matter though is how these cards all start to create the context for what might be the single most satisfying engine-builder I have in my collection. Cards have their own quiet, internal value but where they really shine is as the pipes, cogs and motors that drive the economy of your corporation. With the right cards played in the right order, you can accomplish acts of planetary engineering that would make the Gods marvel. Importantly here, this isn’t simply a case of fitting pre-fixed elements into a pre-set configuration. You’re engaged in an act of creative alchemy – you turn base materials into gold by virtue of ecological experimentation. You will build chains of production that for all the work seem to be original creations of your ingenuity. There’s a touch of the Imperial Settlers in here in that you’re working to create self-sustaining systems of production that yield outputs far in excess of their inputs. What constitutes a good output though is going to vary intensely from player to player and corporation to corporation. More importantly, it’s going to vary most based on what game of Terraforming Mars you’re actually playing. 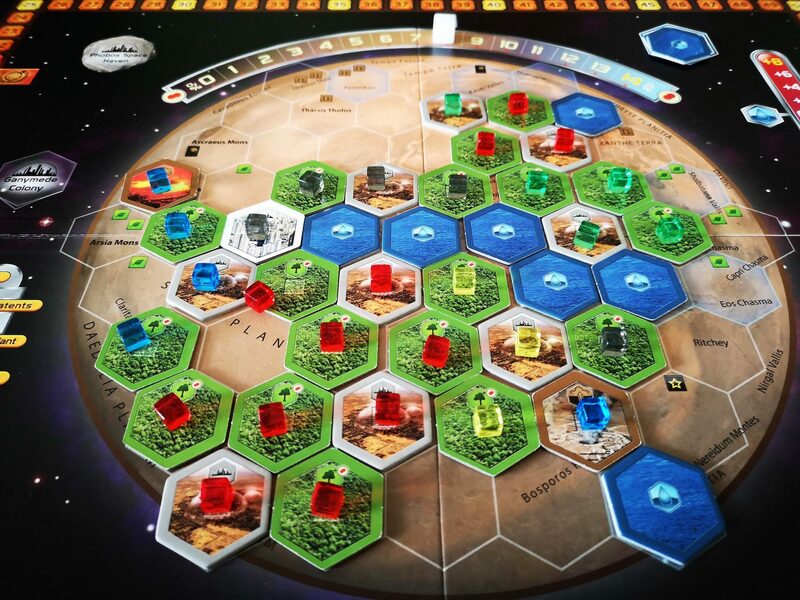 The thing that makes Terraforming Mars so interesting is that it’s not actually one game. It’s really three, each of which come with their own internal mechanisms and incentives. The most obvious one is the shared job of edging those global parameters into their final configuration. A player can earn a lot of points by keeping their eyes on the various gauges and levers that indicate habitability. Your terminating rating, which is enhanced by improving the planet, is a big component of your final score. On the other hand, maybe someone wants to focus on the engine building and the points available from that – and there are many. There’s a card for example that lets you directly convert a piece of titanium into a space-fighter, and each fighter is worth a point at the end of the game. That’s as big a deal as planting acres and acres of forest. Another lets you take six units of electricity and convert that into a unit of research worth two points. These cards can be triggered once per generation, so you might well be incentivised to slow down the terraforming effort to gain the biggest rewards. You might be more interested in doubling down on the unique opportunities your careful card-play has made available to you. Someone else still might be worrying primarily about the area control puzzle that is being played across the whole of Mars. Cities can be placed on the surface of Mars for a chunk of cash. In addition to the extra commercial capacity they give their owner they also earn points at the end of the game based on how many greenery titles are adjacent. You can earn a lot of points by watching where the terraforming is being conducted and leaping in with a cheeky city when it’s worth enough to you. Why should you do the hard-work when others are leaving all those points unclaimed? The risks of that happening are significant – you might earn one point while someone merrily claims two or even three because of their parasitic pragmatism. The risk of this keeps everyone edgy as they fear the risk of their hard work being exploited by a quick-thinking competitor. Woe betide the player that pays no attention to the scenery. 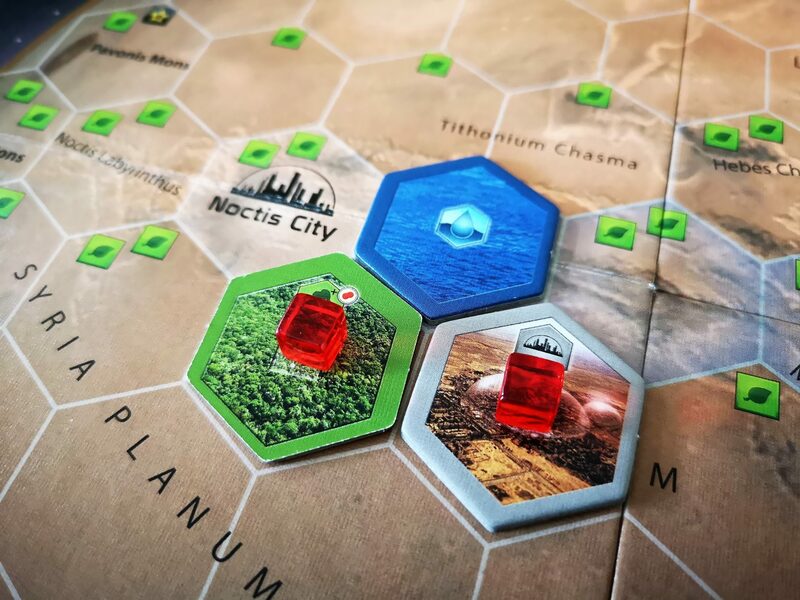 Everyone in Terraforming Mars is going to be playing all three of these games, but the emphasis which they place on each component is likely to be distinctively unique. Importantly too, everyone is going to change and refine their focus during the course of the game. This creates a self-referential game state that is as much a Rorschach test to be interpreted as it is a meaningful puzzle to be solved. You look into the tools you have, into the Mars that you’re all working towards building, and read your own truth in the entrails of a living planet. That creates a context for some fascinating emergent effects in the game and the economy of cards. And my, what a collection of cards there are. It’s rare that decks this big should contain so little filler, but that’s genuinely what you get here – huge decks of startling creativity and ingenuity. Each of those cards are potentially the linchpin of an internal economy that can generate startling numbers of points every single generation. That by itself would be enough to sustain a genuinely interesting and innovative game, but we’re not done yet with the generosity Terraforming Mars has stuffed in its box. It begins with a slow, ponderous accumulation of scant resources that would be excruciating if you weren’t doing something so obviously impressive. Sure, you might only do one thing in your turn but when that ‘one thing’ is smashing a moon into the planet surface it still feels monumentally significant. And it has the rewards to match. But as you play down cards and gather resources, you find it starts to open up dramatically – you might go from playing one card in a generation to two in the next, and then four. Before too long you’re triggering a half-dozen actions that are complexly unique and generating hefty handfuls of cubes every generation for your stockpiles. There’s no upper limit to how many units you can produce of a resource. On occasion I’ve found myself generating thirty or forty units per turn in an economy where eight is enough to permanently impact on the ecology of an entire planet. The final turns of the game tend to suffer from intense slowdown as people work their way through a checklist of actions that feed into and accelerate other parts of their engine. 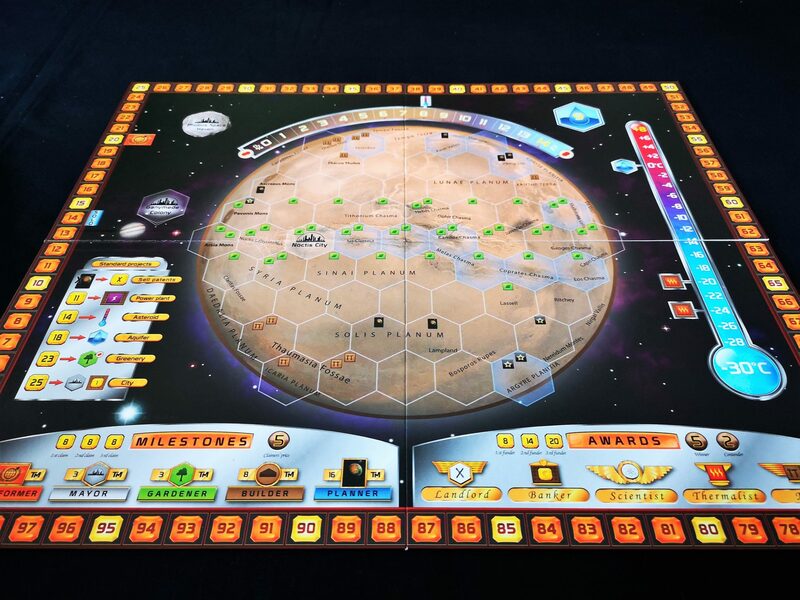 Terraforming Mars converges towards a conclusion that doesn’t feel epic. It feels like navigating an old Windows install where every click on an icon is accompanied by a solid minute of whirring computer fans. There’s a lot of this kind of thing, and given the bespoke nature of the engines that you create from game to game it’s rarely the case that people internalise the quirks of the system. Tricks that work one game might not work in the next and that results in every new session needing players to learn anew the tricks that will kick their engine into glorious and exploitable life. It takes time to work it out, and that time can only be spent during the game. Terraforming is a process that takes many generations, and you’ll feel those long, slow centuries on your shoulders as you simply wait patiently for your turn to come around again. Every generation begins with a ‘research’ phase where you draw four cards and choose which you want to buy and keep for play. Some terrain squares on Mars also grant you a card draw, and a few events and special projects give you further opportunities to draw cards into your hand. But remember how I said that that cards have pre-requisites and often require Mars to be in a particular configuration before they can be played? Those cards don’t disappear from the deck when their playable life is over. Instead, they float into your hand like you’ve been scooping turds out of a sewer. The last thing you want to see in the end-game when struggling for every last point available is a card that could only be played when Mars had no foliage. At the most critical part of the game you’ll often be choosing between a pile of cards that are no longer at all relevant to the project. It’s like you’ve just discovered the technology for building cows and someone comes along and says ‘Hey, I’ve been working in the lab all night and I’ve found out how we could cultivate microbes if this planet wasn’t already so hospitable’. These weird anachronisms are pace-breaking and really dissatisfying. The only solution is to hope that you pick up cards that let you draw sufficient extra opportunities to offset the weirdly stochastic research philosophy of the Red Planet. That feels especially unsatisfying considering that other games have already solved this problem – consider Through the Ages for example which has decks ordered by technological age and gradually obsoletes old cards out of your hand. There are no mechanisms for drawing extra cards during your generation that aren’t in themselves card dependent, and if you don’t get the option to buy and play one of those early on in the game you’ll find yourself at an intense disadvantage. Those big decks of cards mean that the odds are always against you if you need a particular capability to complement what you have. There’s no way of actually directing research efforts towards finding it. Getting the cards that underpin your strategy is critical, but the system is too random to rely on – all you have is the equivalent of a Community Chest card draw. Sometimes you’re just doing the best you can with the bits you have. Many is the game of Terraforming Mars where I’ve built a metaphorical train without an engine, or a Fred Flintsone car I had to propel forward by foot. To be fair, some of the mini-engines you’ll be looking to build feel super broken but the only thing the game does to balance that is to erratically distribute its largesse. That might mean everyone is stuck making do, or one player has all the shiny toys and everyone else is screwed. As the game progresses you’re going to want to start converting less useful resources into those that are more important, but again your ability to do that is set by the cards that come your way. By the time you’re looking to offload excess heat production or cash in on your titanium, the finale of the game is hurtling towards you and you don’t have time to wait it out for a few generations. The result is that you’re often left with vast stockpiles of resources you can’t use through no fault of your own. For a game so precise and intricate, with parts expertly meshed like a fine Swiss watch, it’s weird that the research system is so utterly half-hearted. Terraforming Mars relies on people doing terraforming, but I don’t think it does a good job of incentivising it. You can get many more points by acting to delay the terraforming, or taking advantage of a pause in progress. If you’ve got all the oxygen you need, a canny player can begin planting greenery with wild abandon and rack up multiple points per tile. If you’re focused on your score, that’s the savvy play, but it’s also the one that drags the arse out of the session. You need someone with a killer instinct and the willingness to act on it. More than that though, you need that person to have the tools to accelerate everyone towards the conclusion. Your individual incentives only occasionally align with the collaborative goals. The effect of the combination of these problems is that you’re often left listlessly picking at chunks of Mars like a sad dieter at a salad bar. If you’re going for a strategy that emphasizes terraforming, you need to be getting your heat and plant production up so as to ensure that you get the planet ready before anyone else can really ramp up their engines. 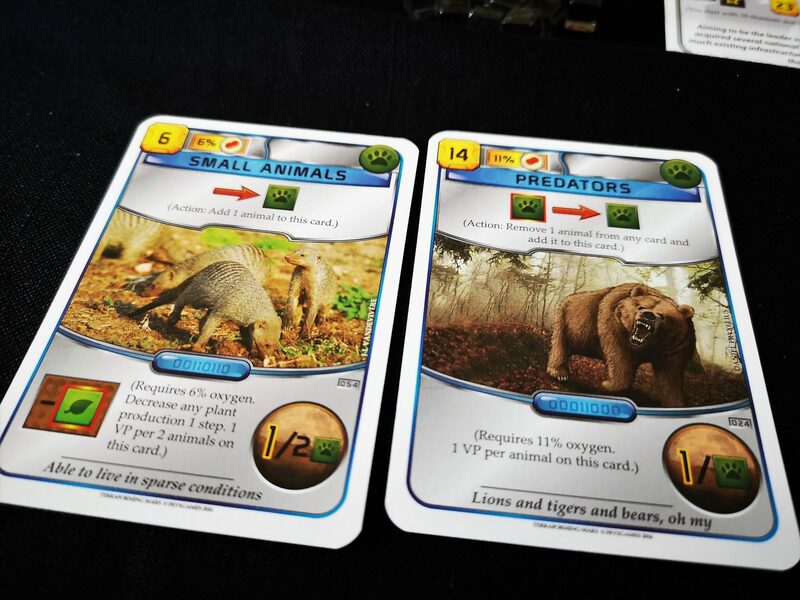 If you’re aiming at area control you need money and plants, and again that’s heavily influenced by the cards you have available. If you’re building your own console of point generating cards then you might find being able to generate sufficient amounts of a single resource is critical. That would be a minor problem if it only affected one player, but the thing is this all affects the tempo of the entire game. 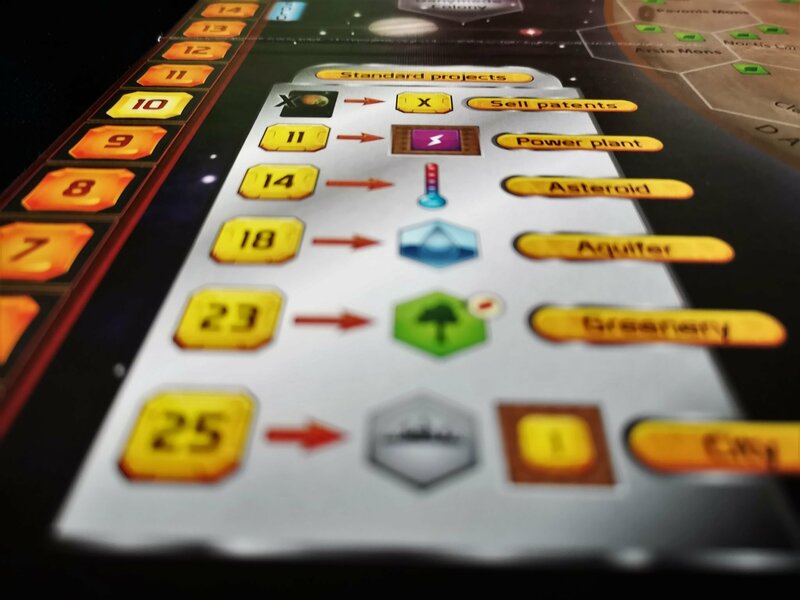 Terraforming Mars drags on without at least one player dumping copious resources into the end-goal of habitability. That though isn’t really where the fun is, and it’s not where the most generous rewards are to be found. 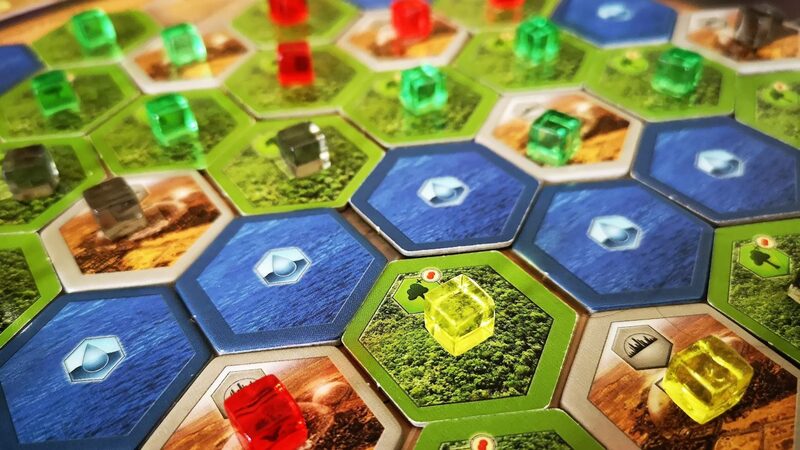 As such, the only thing the design does to encourage a punchy game is to make terraforming more convenient. The standard projects available in the game do a fair job of that except that they are always the least satisfying thing you can do. To perform a standard project always feels a bit like a missed opportunity. A sad default for when you are not in a position to do something fun. That’s a shame, because Terraforming Mars really asks its players to do the heavy lifting as far as immersion goes. The game has an entire planet to fill full of cities, forests, mines, volcanoes and nature reserves. You’d think as time went by the board would look ever more impressive as it gradually became a riot of colour and beautiful scenery. The Terraformed Mars doesn’t look like a planet that is bursting into vibrant life – it looks like an ordinance survey map onto which someone has sprinkled some translucent Oxo cubes. The place where you find the theme being most heavily evoked is going to be in your own mind because it sure as hell isn’t happening on the board. These are substantial flaws. However, they’re not show-stopping flaws. Terraforming Mars remains a genuinely great game with even all of this. Even with the player boards that are so thin and flimsy that merely brushing against them with a sleeve will magically convert steel into titanium or triple your plant production, Terraforming Mars is a great game. If only alchemists knew the secret to transmuting base metals into gold was loose fitting clothing. Even with the painful creaking of time that accompanies the iteration over player actions, Terraforming Mars is a great game. It could easily have been more though and I think it deserves the attention of a publisher more respectful of the game they have in their possession. That wouldn’t necessarily fix some of the more structural design problems but it certainly would make it more interesting to stare at the board while you waited for your turn. But still – Terraforming Mars is a great game.